Hello everyone, and welcome back. This month, the Sin City Stamps design team will be sharing projects using some fabulous products from Cottonwood Arts. I was lucky enough to receive their large canvas notebook. It has thick chipboard pages covered with canvas, allowing it to hold up to lots of wet, heavy mixed media. For my first project of the month, I made a journal page using my notebook, some stencils, rubber stamps, and lots of mixed media. I have prepared a Snapguide tutorial for your viewing pleasure. I hope you enjoy it. 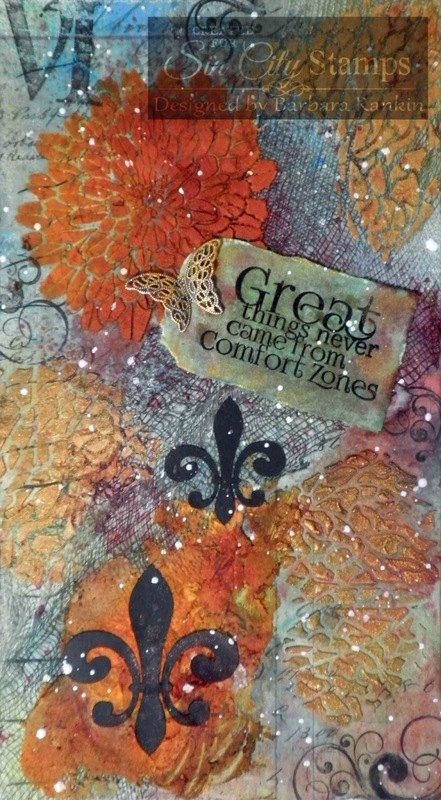 Check out How to Art Journal With Cottonwood Arts Canvas Notebooks by Barbara Rankin on Snapguide. Thanks so much for stopping by. I always enjoy seeing you and I hope you are inspired to give art journaling a try, especially with these wonderful journals from Cottonwood Arts and stamping products from Sin City Stamps. And check back often throughout the month to see what wonderful projects the team comes up with. Have a wonderful, arty weekend, my friends! This is great. Love all the layers! You inspired me a lot with this gorgeous project! OMG, GRACIE!!! What an incredible piece of art! I am SO impressed! The colors and texture - Wow! VERY impressive!